Hello loves! Hope you’re having a wonderful Monday! 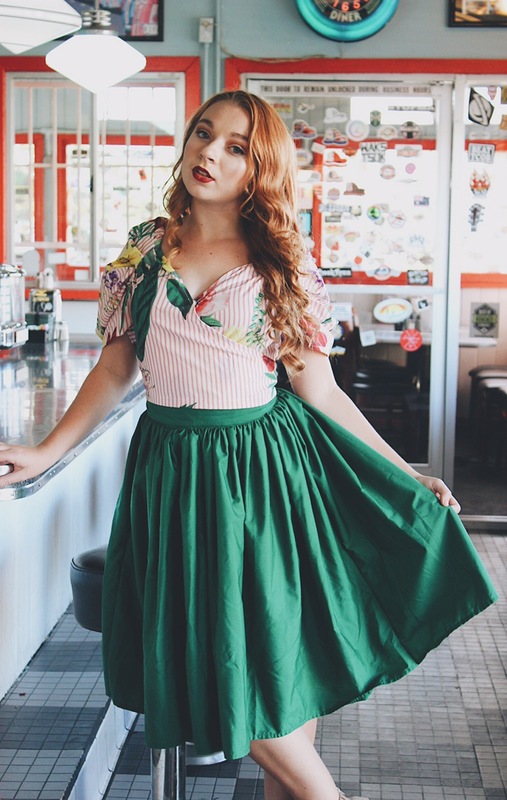 Today I want to share with you another outfit of the day, which includes some really cute, vintage inspired pieces. My top in this post is from Shein. When I saw it online, I wasn’t 100% sure about it, but I thought it would go cute with the skirt. My instinct to get it was right! It’s super cute! I loved the pattern, and the material was really comfortable. It came a little bit big, but again, it’s still adorable. I paired this with a gorgeous Ruby Rae Gathered Skirt that they sent me. 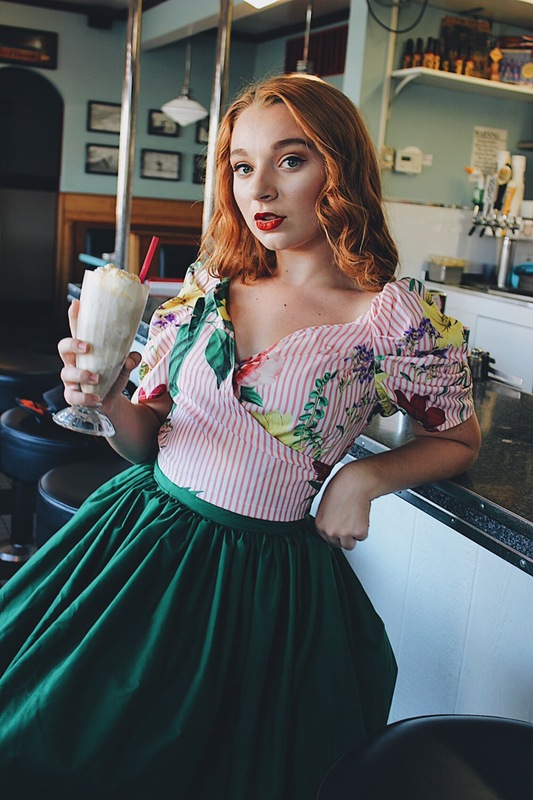 Ruby Rae is a unique handmade brand with a vintage twist. Each of their products are made with supreme quality. I LOVED this skirt! The fathers were so pretty, and it flared out just right! I’m kinda obsessed, and it’s definitely one of my new favorite skirts. Ruby Rae custom designs item too, so if you’re looking to purchase a unique piece, visit their site. My lipstick is my one of my favorite reds Lime Crime’s New Americana(I’ve included this in so many posts). Here’s the link to a full post on that liquid lipstick. 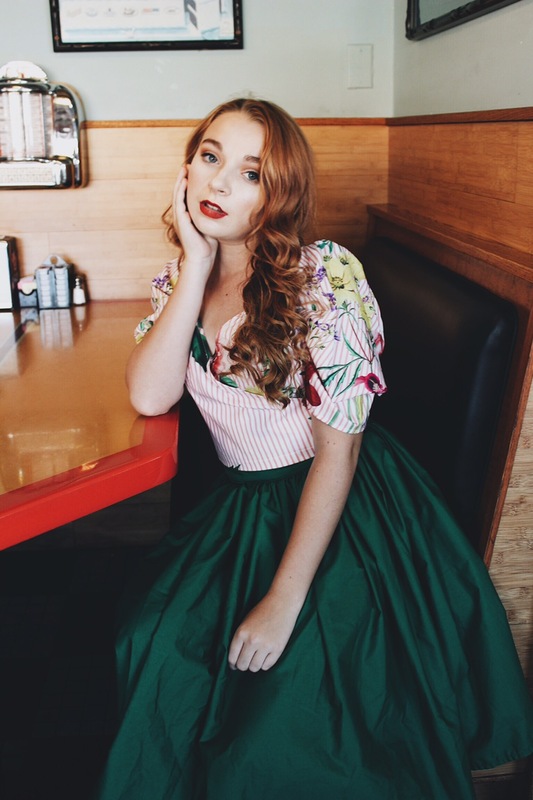 For anyone asking, these pictures were shot at Woody’s Diner Huntington Beach. Anyways, thank you loves for stopping by and reading! Don’t forget to follow and comment! Bye loves! Disclaimer: The products from Shein and Ruby Rae were sent complimentary to review. All opinions are my own. How did you like the service from Shein? I am curious about their business but I hear that sizes are a little off and that it takes a long time until your orders come in. How was your experience with them and would you recommend it? I am PRd with them, so I don’t know if it would be any different as a normal buyer. However, they are always pretty good for me, and their sizes are usually pretty accurate. They always arrive quickly too. My sister actually ordered from them once too, and she liked everything. It also came quickly. So I think it probably depends on where you are located. Also, something I would recommend is reading the reviews on each item(they have a review section) before buying it. They do have some AMAZING, super affordable items! It may be a bit or miss though. I love this set of photos and this outfit! I love this shoot! That green skirt is liiiiife 😍 seriously that color!